Walk 2 blocks west to Madison Ave and take any of these busses: M1, M2, M3, M4 which all go uptown (north). Do not get on the Q32, it goes to Queens. When the bus passes 99th St, signal for a stop (press button or strip). Note: There is no 100th St. Exit the bus and walk north to 101st st then west to 5th Ave. (You will see Central park directly ahead). Turn right (north) and continue. NYAM is 1216 5th Ave (entrance is on 103rd St.). Near the main hotel entrance on Lexington Ave you will see the stairs for the subway at the corner of 51st St.
Take the number 6 train towards UPTOWN (north). It does not matter if the number 6 is in a green circle or a diamond. “Pelham Bay Park” is the correct direction. Ride for 5 stops to 96th Street and exit to street. Note: the next stop (103rd St) is slightly closer to NYAM but is not recommended. 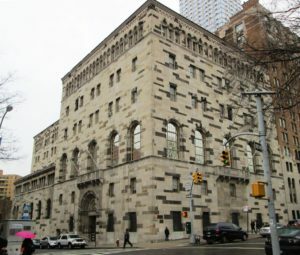 From the 96th St. station, walk 3 blocks west to 5th Avenue (you will see Central Park directly ahead), then turn right (north) and continue about 6 blocks. NYAM is 1216 5th Ave (entrance is on 103rd St.).